Mermaids, unicorns, galaxies, and basically anything rainbow is the current trend in the foodie world! We are seeing more and more rainbow coloured foods in our daily newsfeed. 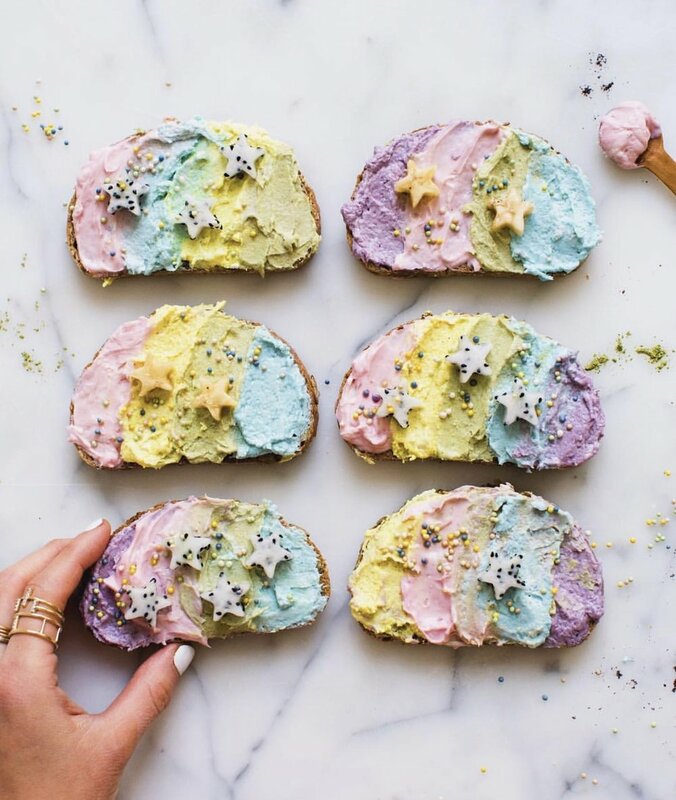 From rainbow sushi or galaxy donuts to unicorn toast. Which really excites me! I’m sure most of you who check my feed know that I am obsessed with vibrant, colourful foods, particularly when it involves an array of veggies! 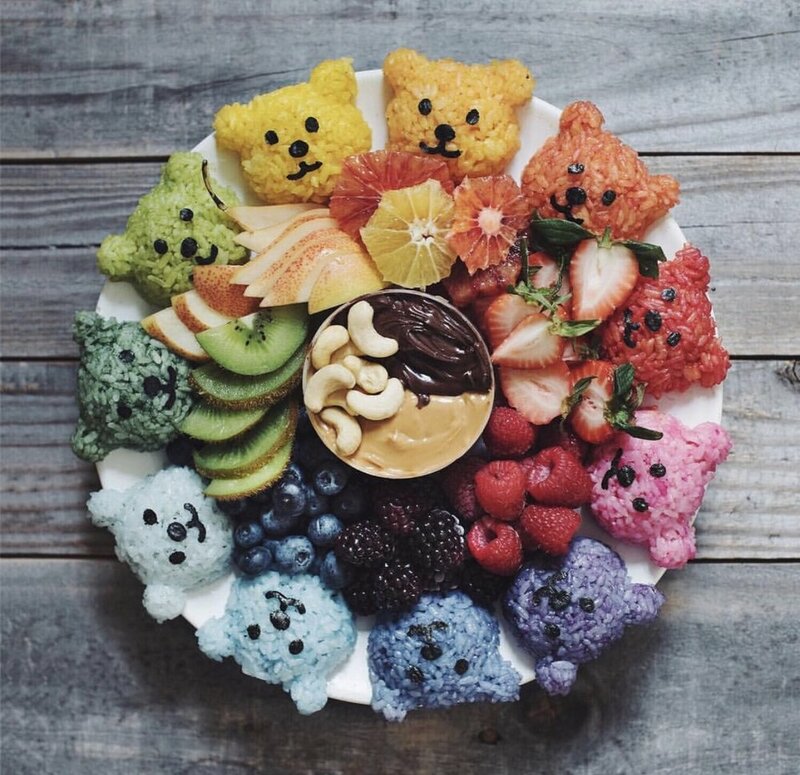 One such account that I stumbled across recently on Instagram who has been setting these trends for over a year is Adeline Waugh from @vibrantandpure a Miami based foodie stylist and creator. 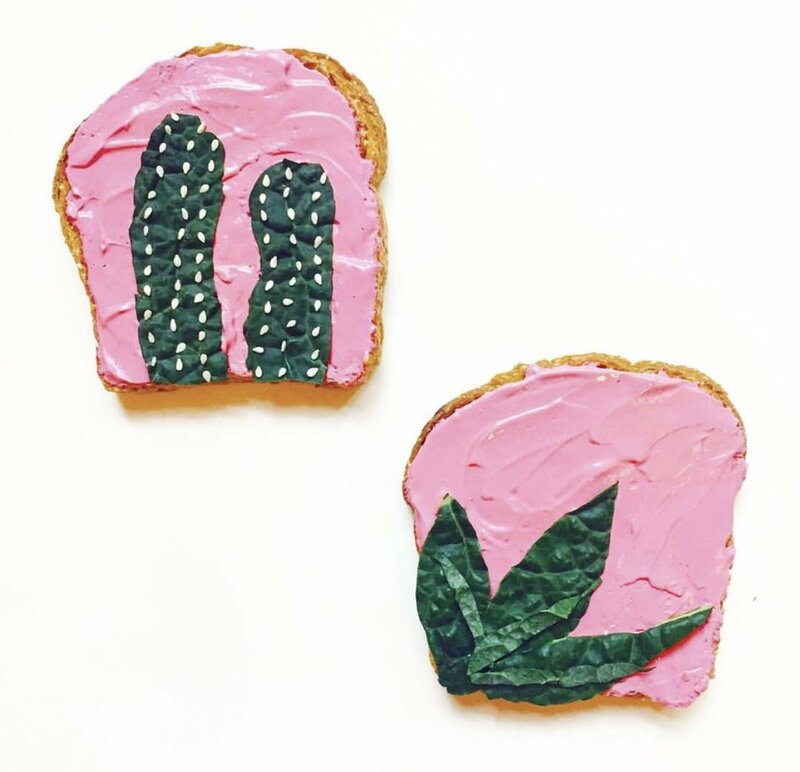 She basically creates artworks on toast using rainbow coloured pastes and all kinds of different toppings. Check it out, it’s really something wonderful! I want to thank her for the inspiration that her account has given to this blog post! Anyway, about a year ago I had a crack at colouring some of my foods rainbow (although I had been creating rainbow meals from the beginning, I hadn’t actually thought of modifying the colours of simple ingredients like rice and yoghurt). I played around in my kitchen with bowls, spoons, and different types of natural colouring agents (like a little scientist mixing potions). Yep, all 100% natural colours, nothing artificial used in making these foods! Because these colours come from natural powders (dried extracts) they sometimes may alter the taste of it, so I had to be sure to not overdo the colouring in order for the meal to still taste good. First up were some rainbow sushi rolls which I created May last year. I coloured the rice 4 different colours and assembled it on the nori paper in 4 even rows, so when rolled up and sliced, each sushi piece was a little rainbow. Very effective but quite time consuming I will admit. I always planned to blog the recipe for this because so many people were excited by this and wanted to know how to make them! Later on, I created some rainbow unicorn ‘paddle pops’. Nope, not the dairy and sugar filled type, I made these from wholefoods such as coconut cream, cashews, dates and natural colours, and I actually shared the recipe for these on my page back in July last year, click here to see that one. For this latest post, I named them ‘Mermaid Bowls’ inspired by my life by the sea. Not only because of the rainbow aspect but I also tried to use ingredients that remind me of the ocean or are from the ocean. Nori paper (dried seaweed), wakame (another type of seaweed), lettuce varieties that remind me of coral and seaweed (red coral leaf, radicchio, green leaf), and purple cabbage. As one of my colouring agents I used spirulina, a dried powder made from algae. Finally, the slicing of the avocado, reminding me of fish scales). I also wanted to simplify the way I rolled the sushi and made the rainbow rice balls (reminiscent of colourful coral gardens). - Red/Pink: I use a beetroot powder, you may also use a berry powder, red dragon fruit juice, or pomegranate juice. - Yellow/orange: I use turmeric powder (just a touch because its flavour is strong), I haven’t thought of any alternatives to this, but if you have any, do let me know! - Green: I use matcha powder and super greens powder, or you can use chlorella and certain types of spirulina. – for this recipe I left green out! - Blue: I use spirulina powder (certain types give an aqua tint), or you can use E3 live (an extract from spirulina), which I am finding it difficult to obtain myself, there is also an extract from the butterfly pea flower. - Purple: I use acai powder and sometimes I use the residual water from boiling purple sweet potatoes, you can also use maqui berry powder. I have used white rice in this recipe as its easier for colouring and also holds together better when making sushi, I have also used a different colour of rice in each sushi roll to speed up the process, and kept the colours light and pastel. Cook the rice as per packet instructions (stovetop/rice cooker), while cooking, prep the rest of the ingredients as per ingredients list. Set aside cooked rice to cool for 20 minutes. Stir through the vinegar and then separate into 4 bowls. Mix in the natural colours (1 in each bowl), adding a pinch at a time until the desired colour is reached. To make the nori rolls (make one roll at a time) place a sheet of nori on a clean flat surface. Spoon out enough rice along the nori sheet to be approximately 0.5cm thick, leaving a 3 cm gap on the edge furthest from you. Place green beans and avocado slices horizontally across the centre. Wet the furthest edge of the nori paper, roll the nori beginning with the edge closest to you, rolling away from you, sealing the wet edge. Repeat this with the remaining 3 nori sheets and remaining 3 colours of rice. You should have enough rice in each colour remaining to create your rainbow rice balls. Place the nori rolls on a plate in the fridge while you assemble the bowls. Begin the two bowls by placing down a bed of lettuce and cabbage in separate piles. Using a rounded mini/condiment bowl, lightly grease it with sesame oil then fill it with tablespoons of the remaining rice, press down firmly then place upside down on a chopping board and tap gently with the back of a knife until the ball/semi sphere of rice slides out. Carefully transfer to the bowls. Make 1-2 rice balls per bowl. Add the shredded nori, wakame, sliced avocado and shallots to the bowls, sprinkle with sesame seeds. Heat a fry pan to medium-high heat, add half of the sesame oil and tempeh. Fry for 1 minute on each side or until golden and crisp. Split tempeh across both bowls. Make the dressing by stirring together the soy sauce, lime juice, remaining sesame oil and chilli, pour half over the bowls, reserve the remaining for dipping the nori rolls. Remove the nori rolls from the fridge, slice into 2cm pieces and serve on a plate. Hope you enjoy this funky fun recipe! Stay tuned as I have loads of new content from my recent trips coming soon, a long list of new recipes I want to share… PLUS the release of my first published COOKBOOK! Drop a comment if there’s any particular recipes you would love to see me create!